Two of us spent at least 2 hours combing the beach in Grant Park Beach (just below the golf course) in South Milwaukee, WI, USA. Afterwards, we enjoyed a nice burger from Ferch's Malt Shoppe. We found several jewelry grade pieces per hour but they were pretty small. I'd rate it "Fair" to "Good"; I hope the pictures will help you decide if my rating is accurate. I don't mind small pieces as long as they are a little bulky and well frosted. These were. I also found a very large spherical piece, (I have posted a request elsewhere here to see if others may know what it was originally). 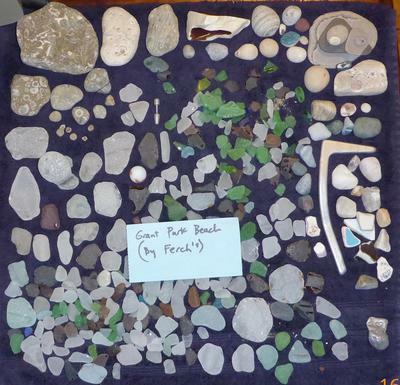 It is by far the most unique piece of sea glass I have found. 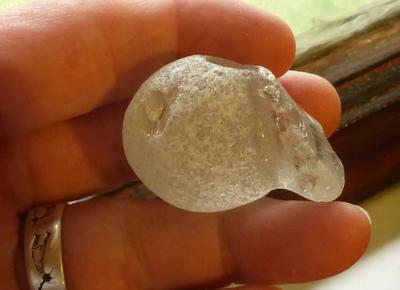 We also found one marble; I love finding these little treasures. 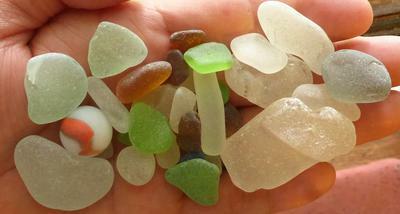 We found several light blue beach glass pieces of decent size (about dime size), they were sufficiently chunky for me. You can also see some rather large pieces that were also well frosted. I also collected some fossils, rocks and pottery shards of interest to me. This was the first time to this beach; I will definitely give it another go, soon! To find the beach, go to Grant Golf course, you will see a road going down to the beach along the southern edge of the course. Sorry, I don't have a clue; it seems to be a hit and miss proposition. I've gone at high tide, low tide, before a storm, after a storm, and sunny days. I haven't been able to pinpoint the best time to go. Just Lucky, is right! I just went yesterday (Sunday) and found another marble. The water was very high.